The other day, I realized I have (for no particular reason) slighted one of the top tag teams to ever wrestle for JIM CROCKETT PROMOTIONS. Today, I shall correct my mistake. The team I refer to is the duo of BRONCO LUBICH and ALDO BOGNI. These guys wrestled on top in MID-ATLANTIC WRESTLING for much of the 1960s. Now, I should point out that this duo was not adored by JCP fans, by any means. In fact, they were at the top of the territory's 'hate list'. LUBICH and BOGNI were ruffians who had no regard for the rulebook, and to make matters worse, the two were always accompanied to the ring by their manager, MR. HOMER O'DELL, without question, the decade's most fan-hated man on the CROCKETT payroll. O'DELL, when managing, always wore a tuxedo and carried his legendary cane, and believe me when I say, this cane was responsible for putting lumps on many an opponent's noggin' in JCP wrestling rings. Through the years, I witnessed many BOGNI and LUBICH and O'DELL matches, both on television and in Charlotte's Coliseum and Park Center. But one match I recall was unique in that the fans actually cheered and pulled for these three rulebreakers the night at the Charlotte Coliseum when, in a Six Man Tag Team Match, BOGNI, LUBICH and O'DELL faced J.C. DYKES and THE INFERNOS. Both managers donned wrestling attire and joined their men as wrestlers. This match was equivalent to a pair of locomotives hitting head-on. Referee Angelo Martinelli certainly earned his payday on this night. 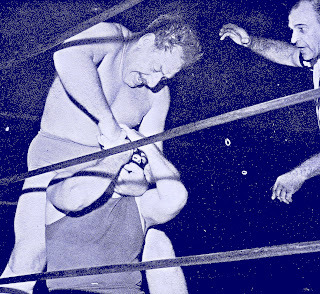 The first fall went to O'DELL's team when BOGNI put one of the masked men out cold with his patented 'corkscrew' hold. The fans went wild. I was stunned. Cheers for HOMER O'DELL! I thought, 'what's next...a man on the moon?" DYKES was able to revive his men and rally his troops in the second fall, which ended with LUBICH on the receiving end of a 'loaded boot' kick to the head, putting him into dreamland. With the match even at this point, the third fall quickly became an all-out brawl. It must have been a NO DISQUALIFICATION match (I can't recall), but had it not been, referee Martinelli would have had to toss it out due to the rulebraking and brutality. Both O'DELL and DYKES were lacerated, and one INFERNO was also dripping blood from a much-torn mask. Then, out of seemingly nowhere, was a huge flash! BOGNI was screaming and down, rolling around the ring in agony. LUBICH and O'DELL grabbed their scorched partner, and bolted for the dressing room. ANGELO MARTINELLI made the twenty-count, and raised the hands of DYKES and THE INFERNOS. 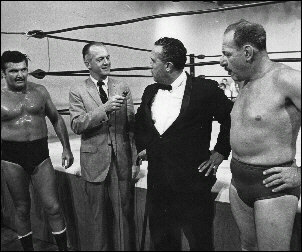 On Charlotte TV the next week, ironically, HOMER O'DELL claimed that 'DYKES and THE INFERNOS were the most brutal forms of humanity and a disgrace to the wrestling business and should be barred from the profession.' Odd that statement coming from him. Link to story on "Mid-Atlantic Grapplin' Greats"
Re-published on the Gateway with the author's permission.